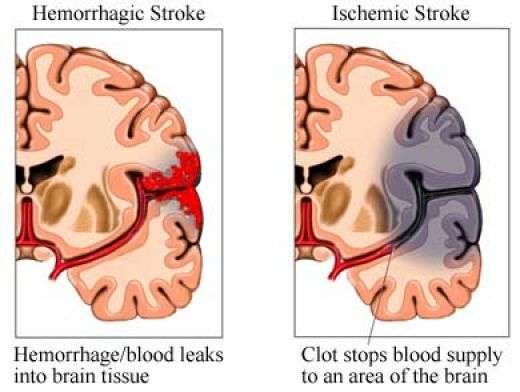 A stroke (sometimes called a cerebrovascular accident (CVA)) is the rapidly developing loss of brain function(s) due to disturbance in the blood supply to the brain, caused by a blocked or burst blood vessel. This can be due to ischemia (lack of glucose and oxygen supply) caused by thrombosis or embolism or due to a hemorrhage. As a result, the affected area of the brain is unable to function, leading to inability to move one or more limbs on one side of the body, inability to understand or formulate speech, or inability to see one side of the visual field. 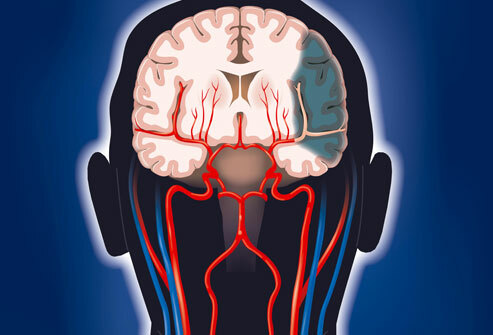 A stroke is a medical emergency and can cause permanent neurological damage, complications, and death. It is one of the leading causes of adult disability in the World. It is the number two cause of death worldwide and may soon become the leading cause of death worldwide. 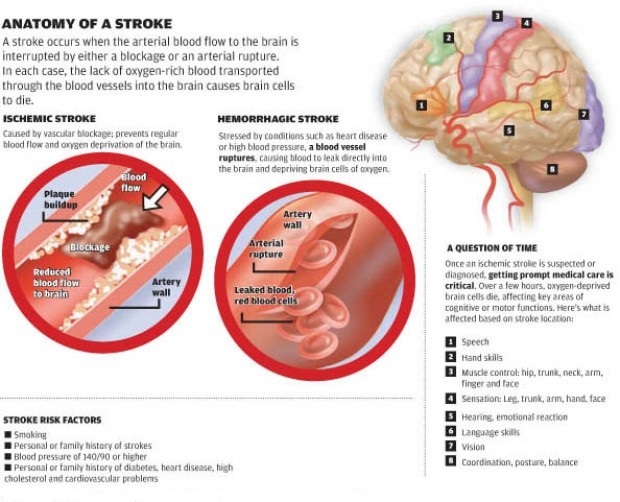 Risk factors for stroke include advanced age, hypertension (high blood pressure), previous stroke or transient ischemic attack (TIA), diabetes, high cholesterol, cigarette smoking and atrial fibrillation. High blood pressure is the most important modifiable risk factor of stroke. Intracranial hemorrhage is the accumulation of blood anywhere within the skull vault. A distinction is made between intra-axial hemorrhage (blood inside the brain) and extra-axial hemorrhage (blood inside the skull but outside the brain). Intra-axial hemorrhage is due to intraparenchymal hemorrhage or intraventricular hemorrhage (blood in the ventricular system). The main types of extra-axial hemorrhage are epidural hematoma (bleeding between the dura mater and the skull), subdural hematoma (in the subdural space) and subarachnoid hemorrhage (between the arachnoid mater and pia mater). 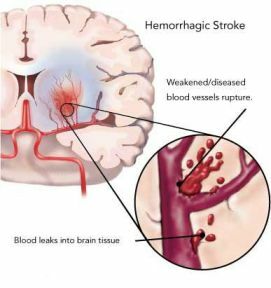 Most of the hemorrhagic stroke syndromes have specific symptoms (e.g. headache, previous head injury). Intracerebral hemorrhage (ICH) is bleeding directly into the brain tissue, forming a gradually enlarging hematoma (pooling of blood).